The Praxis Middle School Mathematics was designed to measure professional knowledge of entry level teacher candidates. Here’s the answer to a Praxis practice test question I recently received from a middle school mathematics test taker. One of the methods to measure the central tendency of a population and/or sample distribution is to get the mean of the scores. In statistics, the total or summation of the scores is also known as ?X. If n represents the number of the scores on a sample, the mean or arithmetic average (M) of the scores is ?X divided by n.
Sample: Find the mean for the following sample of scores: 3, 5, 8, 9, and 10. In this sample, n = 5 since there are 5 scores. We have now the value of n and the total scores of the 5 scores. M=7 The mean of the 5 scores is 7. Let’s have a sample for this. Find the weighted mean for the following set of scores. We need to find the value for each variable in the equation. X1 and n1 corresponds to Sample A scores while X2 and n2 corresponds to Sample B scores in the table. We can now apply the formula for the weighted mean. The weighted average for Sample A and Sample B scores is 11. A sample of n = 6 scores has a mean of M = 12. If one person with a score of X = 10 is removed from the sample, what will be the value for the new mean? Solution: The formula for the mean is M=(?X)/n. On the practice question, n = 6 and M = 12 are given. Let’s apply them in the formula. Using cross multiplication, 12 times 6 equals 72. We could tell that the total score is 72, based on the formula and definition of the mean. What will be the new mean then? Originally, we have n = 6, but since one person’s score was removed, the value of n will become 5 (that is, n – 1 or 6 – 1). With the new data now, ?X = 62 and n = 5, we can compute for the new mean. Option A is incorrect. The original mean is 12. If a score of 12 was removed, the mean would have remained the same. But in the scenario given, a score of 10 was removed, so the mean will definitely change. Option B is incorrect also. The score that was removed was 10, which is lower than the mean 12. Removing a score that is lower than the value of the original mean will absolutely increase the value of the new mean. In this case, M = 8 indicates that the new mean decreased. Option D is nearly correct if only the new total score of 62 was divided by n = 5 instead of n = 6. One score was removed, so n = 5. Miss Kate has 20 students in the classroom. She recently checked her students’ quiz scores and found out that the mean scores for her 13 girl students was 15. The scores of her boy students are as follows: 10, 12, 14, 14, 15, 17, and 19. What is the weighted average score of her 20 students for the quiz? Solution: If n1 corresponds to the number of girl students that Miss Kate has, then n1 = 13. By this, we can already tell that there are 7 boys in the classroom since there are 20 students in the room (20 – 13 = 7). You may also observe that the scores of the boys are seven in number. We may now say that n2 = 7. What is the total score of the girls? The scores were not presented, but we know that M = 15. By this, we can compute for ?X1 using the cross multiplication method. For now, we have ?X1 = 195 and n1 = 13 for the scores of the girls. For the boys, we already noticed that n2 = 7. To compute for the ?X2, we’ll add the scores of the 7 boys. So far, we have already computed for the important values for us to solve for the weighted mean scores. Let’s now solve the weighted mean using the formula. Based on the calculations that were made, 15 (option A) is not the exact weighted average score. Option C is not correct as well since it is just the total of average scores for boys and girls. Option D is another wrong answer since it’s a value that represents the mean scores of the boys, and not of the 20 students. 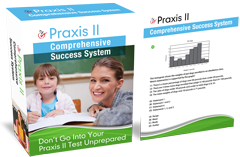 Praxis Study Guide Books to pass-the-mathematics exam right now!